WINDSOR, N.C. — A blistering sun beat down on a spruced-up home on King Street in Windsor on July 14, 2017. Inside, in the blessed cool of a newly installed central HVAC system, well-wishers and family gathered to applaud Jannie Mae Swain. The house, which was undergoing last-minute touches even as the dedication was being held, will soon be home to Swain and her preschool-age daughter Sharniece. Renovation began in late April, when Habitat for Humanity of North Carolina, with help from the local branch of the State Employees Credit Union, the blessings of the Bertie County Board of Commissioners and the sweat of lots of volunteers, took on the task of renovation. James Bell finishes up the painting even as the dedication went on. 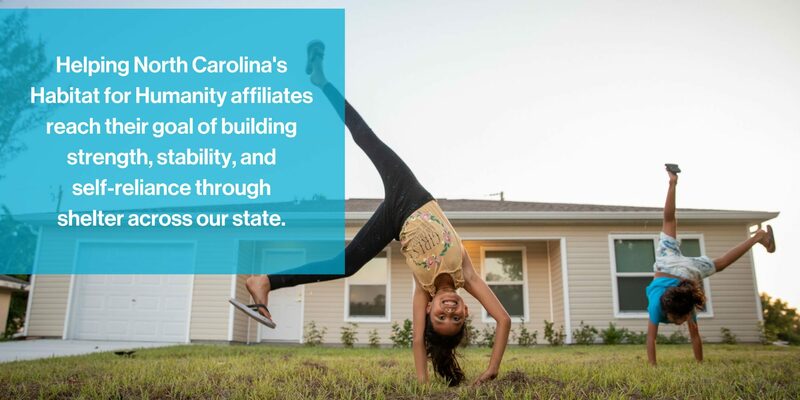 It’s part of the ambitious Mountains to the Sea Challenge, a partnership of Habitat for Humanity N.C., the state’s 67 affiliates, and the SECU Foundation to build a Habitat home in each of North Carolina’s 100 counties. When each house is completed, the homeowner assumes a zero-percent mortgage loan from SECU, which then returns the money to the Habitat affiliate so that another house can be built. For Swain, a life of struggling in low-wage work now holds a new hope for a stake in the American dream of home ownership. That hope took root on April 21 as a group of Habitat for Humanity officers, State Employees Credit Union representatives, Bertie County officials and Swain’s friends – and even her boss at Burger King, where she has worked for 24 years – gathered for a brief ceremony to mark the kickoff of the project in this rural patch of northeastern North Carolina, just west of the Albemarle Sound. The sturdy little house, with an inviting front porch, sits on an expansive lot in a neighborhood that is beginning to show signs of health. Across King Street sits a tidy, attractive home with a pretty garden, but next door to Swain’s new place is a house that appears to be ready to be bulldozed – abandoned for years, sick with rot and sagging under a thick tangle of vines. It’s a scenario that can be found in dozens of rural towns in North Carolina. The prosperity and growth that have come to North Carolina’s municipalities has mostly missed the state’s rural sector. Even so, Windsor has grown from 2,383 souls in 2010 to 3,630 in 2010, and Bertie County, population 20,106 in 2014, had a relatively low unemployment rate of 5.6 percent as recently as December. For Tammie Lee, there’s also a lot riding on this house. Lee, a Bertie County commissioner and 32-year resident, is delighted to have Habitat for Humanity at work in Windsor. The SECU Foundation has put up $10 million for the Mountains to the Sea Challenge. Chuck Poe is a consultant charged with supporting the effort of the SECU programs in counties that were not covered by Habitat affiliates. Poe understands the challenges for the working poor who live in North Carolina’s rural counties. “Folks in those income brackets tend to live hand-to-mouth,” Poe said. “They are gainfully employed, they’re doing their best. But their credit rating is a challenge,” and an acceptable credit rating is a requirement to qualify for Habitat. “They’ve never really had a need for a credit rating; they’ve never borrowed a lot money, and they have no credit history.” That’s why a compassionate lender such as SECU is important, Poe said. 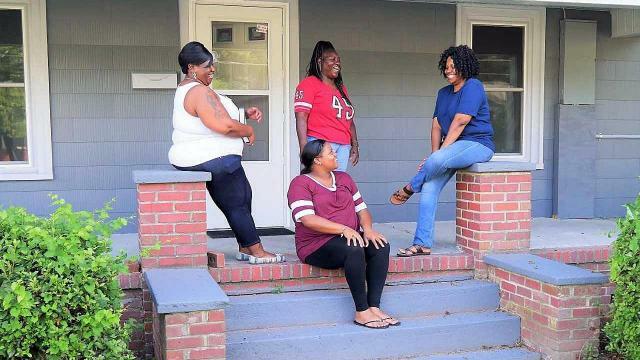 Homeowner Jannie Mae Swain, left, enjoys some quality time on her new porch with her sisters Vaniqua Brown, on steps; Bobby Douglas, standing; and Diana Swain, right. Lee said there are jobs available – as evidenced by the low unemployment rate – at Bertie Correctional Institution, which opened in 2006 and has a capacity of 1,400 inmates, as well as at Bertie Memorial Hospital. But too many residents don’t qualify for those jobs. As for Jannie Mae Swain – a Bertie County native, born in Windsor “down the neck” – her face lights up when she thinks of settling into a modest, pretty home with her daughter.